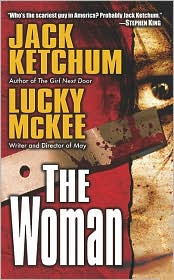 The final entry into Jack Ketchum’s Dead River trilogy, The Woman, was published recently. Since the movie version emerged at the same time, and since both film and book credit Lucky McKee as the co-writer, I assume both were produced together. I wouldn’t call the novel a “tie-in” book, but they seem to work simultaneously. So similar are book and movie that they can be considered one production. In the opening chapter of The Woman, we discover “The Woman” of the last novel miraculously survived a knife strike. Given the description of her dispatch in Offspring, this is a little hard to believe, but it’s not the first time a monster has lived again to terrorize another day. 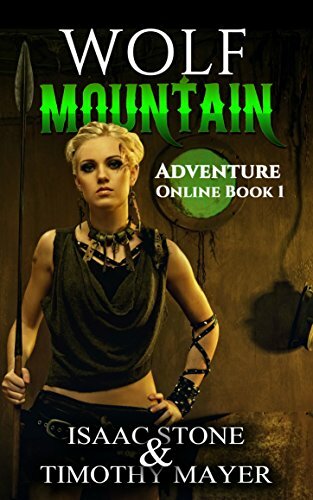 Some of the chapters are told from her point of view, but a leader of a feral cannibal clan which has survived by avoiding civilization has a limited frame of reference. You’d have more insight into a black panther as it regards it’s prey from the other side of a cage. We’re also introduced to a family named Cleek: Christopher, the lawyer dad; Belle, the stay-at-home mom; Peggy, the troubled teenager; Brian, the even more troubled teenager; and Darlin’, the innocent preschooler. They all live on a big isolated farm in Maine, the scene of the last two novels. There is something bad wrong with this family from the very intro. This is also the second time Ketchum has used a scumbag lawyer in the series. Draw your own conclusions. The opening scenes are apple pie until Mr. Cleek, out hunting alone, spies the woman bathing in a stream. He decides to take her prisoner and turns his old root cellar into a prison. He doesn’t even tell the family why he needs the cellar cleaned, they just do it out of duty and fear. Cleek’s hunting alone adds a sense of foreboding to the novel. Why would any sane person hunt by themselves with a dangerous rifle who didn’t have to? Didn’t the state of Maine issued warnings about wondering around in the woods after events in the first two novels? And what the hell has lawyer Creek been hunting besides deer? We never do find out. In short order, he manages to capture the feral woman and chain her up in the cellar. He simply informs the assembled family unit that they are going to “civilize” her. Right. After a mishap when he gets too close, Cleek shows the family how to shove food in her general direction. And the woman glares at her captors waiting for the first opportunity. The authors mess with the reader’s sympathizes by turning the woman into an object of pity. You can’t help feeling sorry for her when she’s getting hosed down by Cleek and company. On the other hand, you have to remember she’s dangerous and will kill anyone in her path. There’s a telling moment when the woman manages to say the word “please”, trying to get her captors to quit hurting her. However, we are reminded, she learned the word from her many victims. Meanwhile, Peggy’s lesbian math teacher has noted a change in her student. She’s wearing baggy clothes and avoiding the other kids. Could she be pregnant? If so, by who? Should she contact the parents? This is one of the weakest developments in the novel, given that teachers are required by law to report any suspicion of abuse. The teacher’s actions contribute to the final tragedy at the conclusion of the novel. As in the other novels of this trilogy, the real carnage is saved for the final few chapters. You never are able to decide who’s worse, the captors or the captive. The movie version follows the book line-for-line. Pollyanna McIntosh returns as the feral woman she played so excellently in the the film version of The Offspring. Because her demise wasn’t so conclusive in the last film, it’s believable that she survived. It’s best to read the book before seeing the movie as the book is able to tell you what’s going on internally with the characters. You better understand why the teacher does what she does to intervene with Peggy, the oldest daughter. The book’s finale makes more sense as well because they never subtitle the woman’s language in the film. My only complaint with the novel is that it brings out crucial information about the Cleek family toward the end. There’s some hints, but nothing is made clear until the last violent scenes. Again, the book does a better job of handing out the information than the movie, but it’s still a little too late to advance the plot. And the movie has an annoying indie rock score. Still an excellent horror novel with a superb movie adaptation. Don’t experience either if you have a repulsion to watching the gore fly.